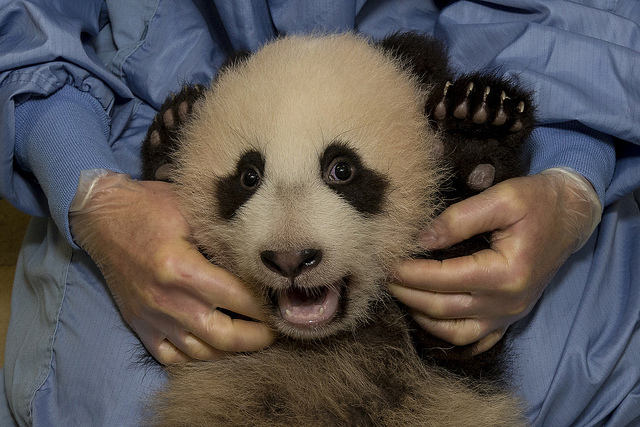 Giant panda cub Xiao Liwu, San Diego Zoo. ©San Diego Zoo Global. All rights reserved. Edited by Jerald Silverman, et al. Physician's desk reference, 69th ed. Restraint and handling of wild and domestic animals, 3rd ed. Zoonoses: infectious diseases transmissible from animals to humans, 4th ed. By Rolf Bauerfeind et al. By Nico Schoemaker, et al. Zoonotic diseases: a summary of the more common maladies afflicting animals and man, 3rd ed. Veterinary staff at San Diego Zoo Global have access to UC Davis' electronic journals collection. Please contact us if you have questions. Parasitological literature collection -- free full-text articles.100+ publications, 20,000 pages of references. Key resource for researchers in emerging diseases, zoonoses, global animal health. Important veterinary medical literature -- free full-text articles. Includes conference proceedings and books. Requires registration -- free for veterinarians and vet staff. 13,000+ OIE publications on animal health & welfare. Documents database -- 5,000+ free full-text reports & articles. Biomedical and veterinary literature (citation database). Free full-text articles: PMC (PubMed Central). 700+ free full-text books in the life and health sciences: PubMed Bookshelf. Wild animal natural history, health, and management literature -- free full-text articles. Document library: 200+ published manuals, books, and articles. Encyclopedia: topical articles and reference. through the veterinarians' UCD login or submit a request to library@sandiegozoo.org. Alpi KM, Stringer E, DeVoe RS, Stoskopf M. 2009. JMLA. 97(3):169-177. DOI: 10.3163/1536-5050.97.3.005. Larson RL, White BJ. 2015. J Am Vet Med Assoc. 247(3):254-8. DOI: 10.2460/javma.247.3.254. PMID: 26176724. Veterinarians can download full-text through UCD, or SDZG staff may submit a request to library@sandiegozoo.org. Larson RL, White BJ. 2015. J Am Vet Med Assoc. 247(1):58-64. DOI: 10.2460/javma.247.1.58. PMID: 26086229. Veterinarians can download full-text through UCD, or SDZG staff may submit a request to library@sandiegozoo.org. White BJ, Larson RL. 2015. J Am Vet Med Assoc. 247(5):496-500. DOI: 10.2460/javma.247.5.496. PMID: 26295554. With over 2,000 full-color illustrations, Pathologic Basis of Veterinary Disease, 5th Edition provides complete coverage of both general pathology and pathology of organ systems in one convenient resource. In-depth explanations cover the responses of cells, tissues, and organs to injury and infection. Expert researchers James F. Zachary and M. Donald McGavin keep you up to date with the latest advances in cellular and molecular pathology plus expanded coverage of genetics and disease, incorporating the newest insights into the study of disease mechanisms, genesis, and progression. Already the leading reference for pathology, this edition also includes an enhanced website with images of less common diseases and and guidelines for performing a complete, systematic necropsy.